To generously donate any amount, click HERE. Sifting through archaeological dig samples at 2018 science camp. The summer is a great time for kids to learn about the natural world and their place in it. Yet, the cost to Nuu-chah-nulth families to send their children to summer camp is usually too great. Unemployment rates are high in isolated west coast communities, and travel costs are even higher. The upside to this story is that with your help, we can begin to shift the tide. In our Nuu-chah-nulth communities on Vancouver Island’s west coast, we’re working to make sure children in remote areas are exposed to science and traditional knowledge from their elders and knowledge holders. Nuu-chah-nulth and other First Nations are underrepresented in resource management and harvest careers and we would like to change that. 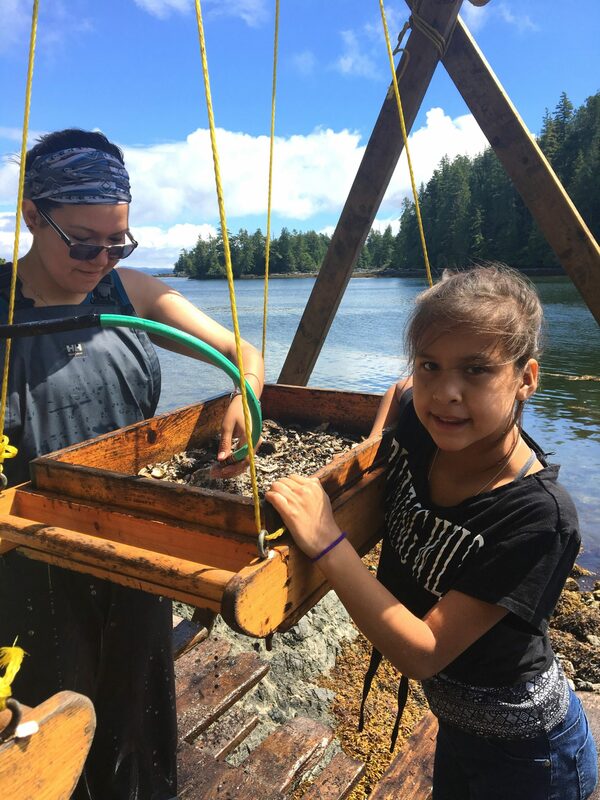 Uu-a-thluk science camps help re-connect Nuu-chah-nulth children to ocean resources, encouraging them to pursue jobs related to marine science, medicine/health, chemistry, biology and environmental science/conservation. Through being exposed to science in this way, the kids can recognize many possibilities for careers in the field. We partner with Science Venture (a program based at the University of Victoria) to be able to deliver science camps in Nuu-chah-nulth communities. Donations are collected through the University of Victoria website, on the Science Venture page. Donating $125 will send one child to camp. To donate any amount, click HERE. Your contribution will help us bring science camps to Nuu-chah-nulth communities and allow a child to spend one week learning about biology, chemistry, physics, engineering (including traditional ocean knowledge) in an engaging way. These early experiences can greatly impact a kid’s life and positively influence his or her life choices. Last summer, approximately 100 children from Ehattesaht/Chinehkint, Hupacasath, Uchucklesaht, Mowachaht/Muchalaht, Tla-o-qui-aht, Tseshaht and Ahousaht First Nations participated in Uu-a-thluk science camps. Since 2005, Science Venture and the University of Victoria have partnered with Uu-a-thluk to bring a combination of science and Nuu-chah-nulth cultural knowledge to kids in Nuu-chah-nulth communities. Currently, Nuu-chah-nulth people are under-represented in careers like fisheries, aquatic biology and management. Science camps help foster interest in these areas, while allowing for hands-on learning experiences. What is Science Venture camp? Science Venture is a non-profit organization that offers hands-on, minds-on science for kids in grades 1 through 12. Science Venture’s programs are operated through the University of Victoria. What else happens at science camp? Uu-a-thluk works with Nuu-chah-nulth communities to incorporate traditional teachings into our science camps. This includes visits and teachings from elders, who hold a wealth of knowledge about managing our resources. We also ensure the science camps delivered in Nuu-chah-nulth communities have a focus on fisheries and the marine environment. Read more about last year’s science camps. Nootka Sound Watershed Society Nuu-chah-nulth Seafood Limited Partnership Pacific Boat Brokers Inc. Pacific Halibut Management Association of British Columbia Pacific Net & Twine Ltd.